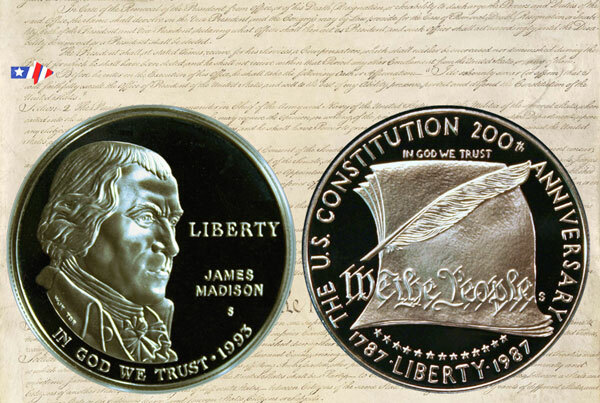 The obverse of the 1987 Constitution and 1993 Bill of Rights Commemorative Silver Dollar Coins remember 227 years ago today. In their suit coats and britches, probably woolen, the chosen men continued their meeting in Philadelphia to hammer out a governing document for the yet-to-be United States. On this day, 227 years ago, they discussed and made changes to several Articles and Sections of their work in progress, the Constitution. In discussion, Mr. Wilson of Pennsylvania thought the general provision for oaths of office, in a subsequent place, rendered the amendment unnecessary. However, the change passed in the affirmation with seven “Ayes,” one “No” and three absent. Though very involved throughout the convention, Colonel Mason did not sign the Constitution. He disagreed with several points and left the convention before it ended in September. Mainly, he fought for individual rights and against the potential of a tyrannical government. By the time the states began deciding whether to agree to the Constitution, Colonel Mason became one of its biggest opponents. Even after the required number of states, nine, ratified the Constitution, Mason continued to be vocal about the document’s deficiencies regarding individuals’ rights. As a result of Mason and his supporters wanting individual rights, Mr. Madison presented a Bill of Rights during the first Congress with much of the substance coming from documents written by George Mason. James Madison is known as the “Father of the Bill of Rights” for all the work he did to frame the words and push for their acceptance in Congress. 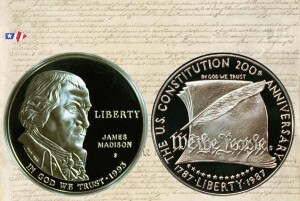 The third page of the Constitution with its phrase for the oath of office provides a background for the obverse of the 1989 Constitution Commemorative Silver Dollar and the obverse of the 1993 Bill of Rights Commemorative Silver Dollar.